The MoD (Ministry of Defence) has confirmed that the home of the Red Arrows display team is to be sold off due to Government cuts. RAF Scampton, in Lincolnshire, will be sold in a bid to save £3 billion by 2040. Six hundred people currently work at the site. Downing Street defended the plans, announced in the RAF’s 100th anniversary year. It said moving to a more “modern and efficient” base would save taxpayers £140 million. Tobias Ellwood, under-secretary of state at the MoD, said the sale will be complete by 2022. Sir Edward Leigh, Conservative MP for Gainsborough, said he was "saddened" that Scampton, which is in his constituency, was to be sold. 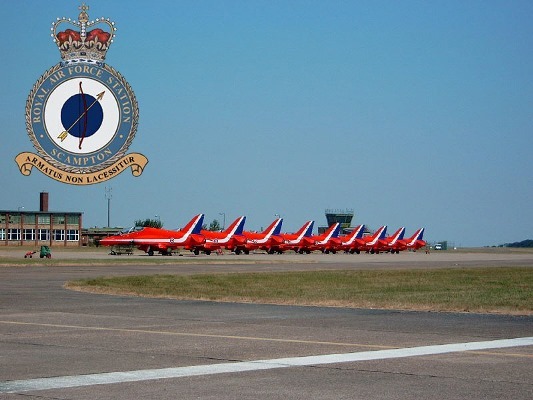 Air Chief Marshal Sir Michael Graydon, Chief of the Air Staff from 1992 to 1997, said: "Scampton is a very good base. It has an extremely long runway and is situated in a part of the country which is ideal in many ways. "I just hope that all of these consequences of closing Scampton are fully understood and appreciated. I'd like to know where they are going to put the Red Arrows. "The Red Arrows have been at Scampton for some time. I remember so well in the past we moved the Red Arrows around from pillar to post and it was not a good time." The 102-year-old base has been at the heart of RAF operations ever since, but after surviving countless rounds of defence cuts it is now being sold. By 2022 the Red Arrows will move to another base. Local people have been taking to social media to express their sorrow and anger. Cath Breach called the decision "absolutely disgusting", adding: "What about the history?" A Facebook group calling for the home of the Red Arrows to be saved has also been established. Far from closing the base it should be listed, developed as an historical site and allow the Reds to stay - after all they listed those awful flats in Sheffield, or #EnglishHeritage should take it over! ONCE HISTORY IS GONE IT IS GONE FOREVER... George Osborne and previous, et al sold off the family silver of this country for a quick buck to balance their books which they can't manage - sorry to bring politics into it... but it is relevant! We'd love to hear your comments on the closure - please share your thoughts below! Royal Air Force Scampton is an operational Royal Air Force station located adjacent to the A15 road, near to the village of Scampton, Lincolnshire and six miles (9.7 kilometres) north-west of county town Lincoln in England. RAF Scampton stands on the site of a First World War Royal Flying Corps landing field, originally called Brattleby. The station has remained in operation almost uninterrupted ever since and has provided a base for fighters in the First World War, bombers during the Second World War and V-force Avro Vulcans during the Cold War. RAF Scampton during WW2 At the outbreak of the Second World War, Scampton transferred to No. 5 Group RAF in Bomber Command and 49 Sqn and 83 Sqn moved in, re-equipping with Handley Page Hampdens for the hazardous task of low-level minelaying (code named 'Gardening') and the bombing of ships. By 1942, the squadrons had changed to the Avro Lancaster but were then replaced at Scampton by 57 Sqn and 617 Sqn. 617 was specifically established for the Dambusters mission codenamed 'Operation Chastise' in which Wing Commander Guy Gibson led the attack on the dams in the Ruhr Valley, for which he was awarded the Victoria Cross. The grave of his dog, run over and killed the day before Operation Chastise, can still be seen at Scampton.